grappling with instability exists in conversation with two other pieces: the truth is buried and peaceful transitions. they have permanent homes in crystal city, arlington, VIRGINIA. grappling with instability deals with juxtaposition as a source of conflict and of creation. We see surface textures better when they contrast with each other; the smooth, cold marble highlights the irregular softness of the fabric enveloping it. Draping a signifier of architectural stability — the pillar — in organic material makes it inviting and gives it emotional stability. The nature of the piece and the structure meant it had to be assembled nineteen feet off the ground, so the process of installation was literally unstable and constantly in flux in order to adapt to its environment. 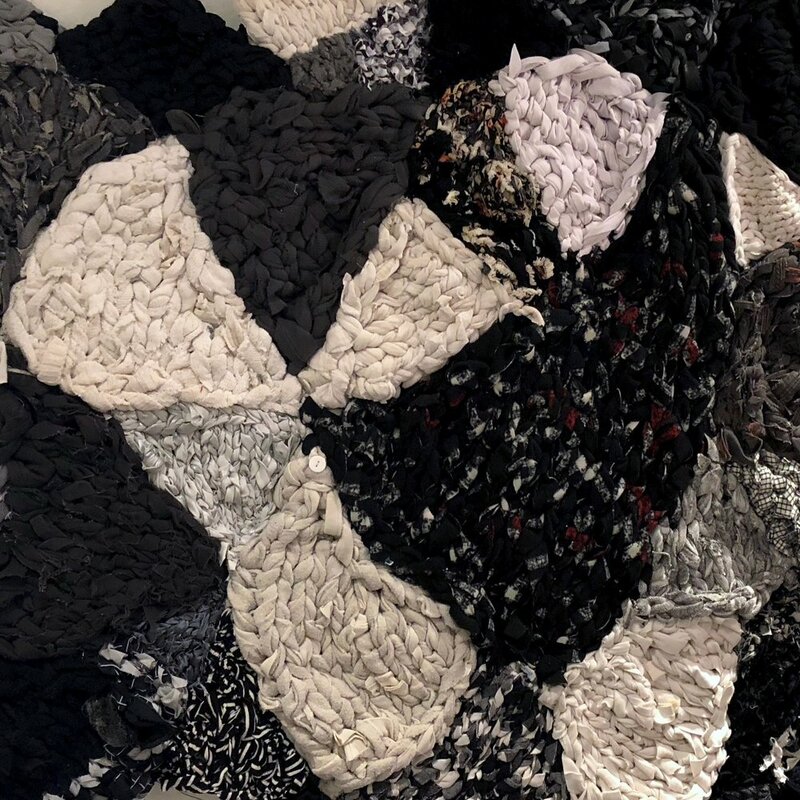 Although the piece is tethered to the ceiling, its strength and integrity ultimately comes from the way it’s attached to itself; each stitch supports the next. This work is truly mixed media, and therefore particularly demonstrative of the power of juxtaposition. 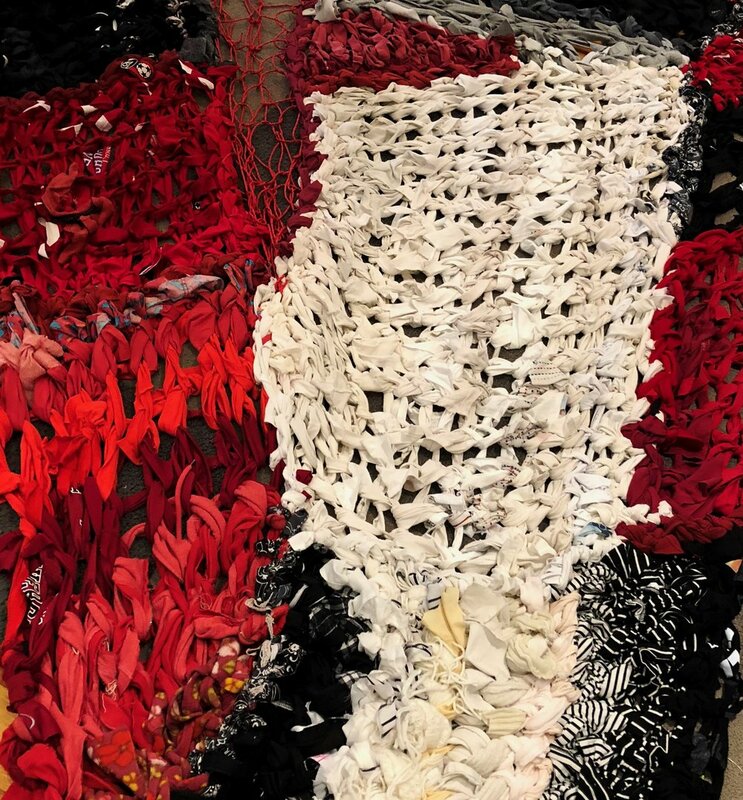 Knitting, traditionally designated as domestic labor, is a way to democratize access to the art world, and placing textile art within and around painting is a way to ensure both are on equal footing. The painting is a visual reference to landscapes and a thematic reference to fake news. We are awash in a sea of distortions — when truths are buried beneath a deluge of lies, it is near impossible to piece together a full picture of reality. 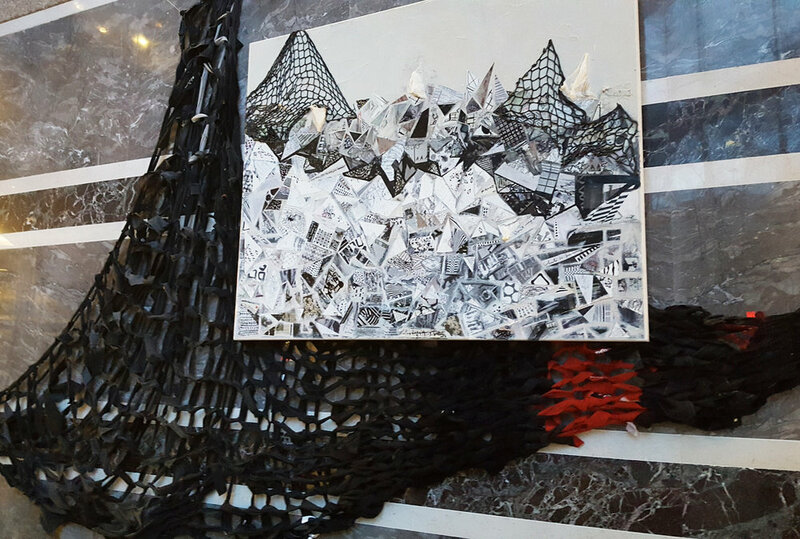 The triangles of paper collaged into the canvas are remnants of words, representing the fragmentation of the truth and the effort it takes to compose a unified narrative amidst chaos. 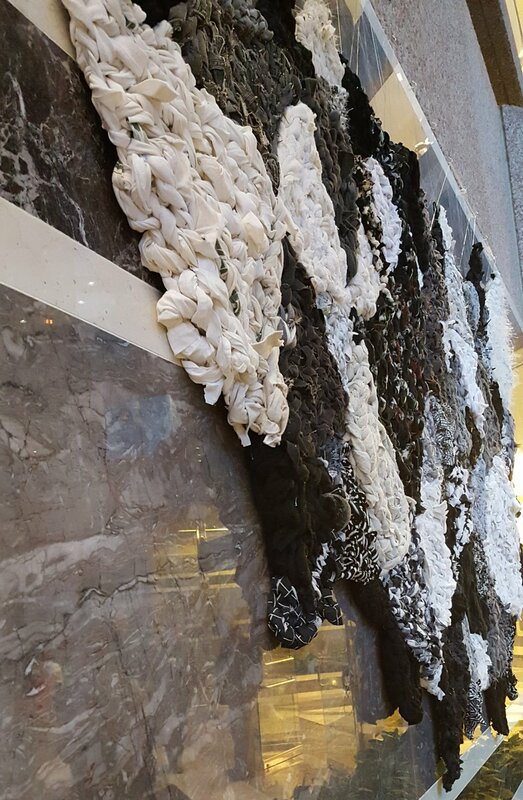 The geometry of the piece as a whole makes it an integral link between peaceful transitions and grappling with instability; stand close to the entrance of the lobby and notice how the fabric behind the truth is buried transforms into an arrow pointing in both directions. Keep moving backwards, and you can see that all three pieces have angles which eventually converge. peaceful transitions is an effort to create a sense of place and belonging. 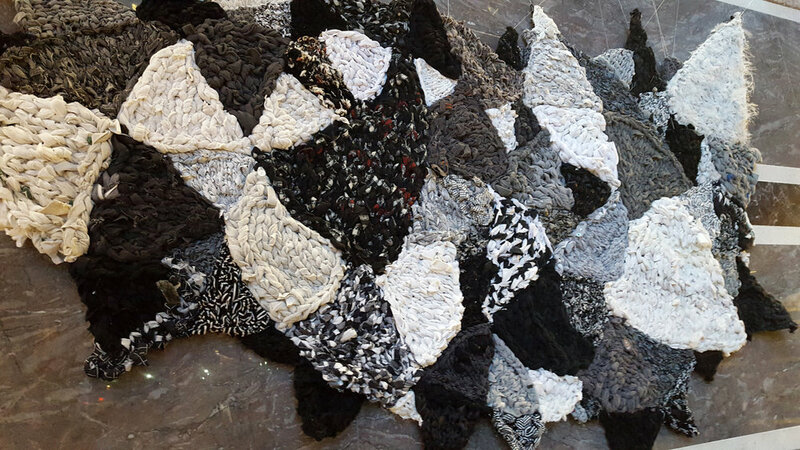 It responds to a tradition of rug making in an effort to bring a sense of home into this public space and ease the austerity of its surroundings. It softens the jarring transitions of a fragmented and broken society by making sense of this shattering, thoughtfully reassembling destruction into peaceful patterns. The subtle shifts in tone and texture are a way to make sense of unexpected juxtaposition; shades of gray bridge the gap between light and dark. Putting silks next to sweatshirts helps us find comfort in both.